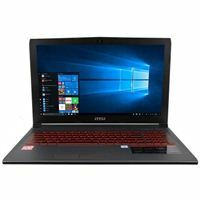 The GV62 8RE-061 15.6" gaming laptop computer features include an Intel Core i5-8300H processor, NVIDIA GeForce GTX 1060 graphics, and a 256GB solid state drive. Enjoy media and content on a 15.6" FHD (1920x0180) screen. Uniquely designed Cooler Boost Technology keeps your laptop performing cool and efficiently. Program your game specific macros for a backlit keyboard by SteelSeries.